A grape grower based in California had a unique challenge in order to meet USDA temperature regulations. The grower needed to continuously monitor and document that their grapes never exceeded 32 ˚Fahrenheit throughout their storage and processing operations. Aside from creating a historical log of the temperature data throughout the operation, they also needed an around-the-clock alarm system if temperatures approached 32 ˚F so they could proactively mitigate risks of failing to meet regulations and preserve the quality of their product. During the processing of the grapes, the temperature of the pallets where the grapes were being stored had to be accurately and continuously monitored under three distinct phases. 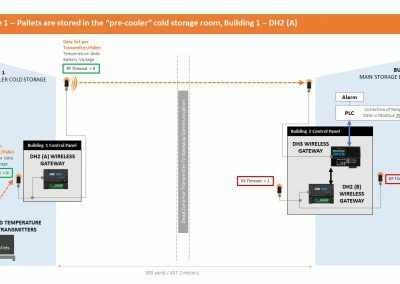 The grape grower needed a continuous, ambient temperature monitoring and alarm solution to ensure their grapes never exceeded 32 ˚F as they moved from one storage containment area to another. Using manpower was not an option due to cost, but more importantly, due to inability of capturing a critical situation in real time to mitigate risks of falling out of regulatory compliance. Additionally, they needed a system that was wireless so that each grape pallet can be monitored independently regardless of where the pallets were located throughout the process. With independent temperature monitoring capabilities, the grower can utilize the alarm system to easily identify pallet(s) needing attention. The wireless system also had to be compatible with their SCADA system and their existing RTD temperature sensors for each grape pallet. 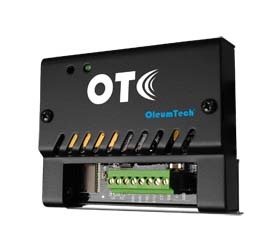 The grape grower turned to OleumTech for help with this unique wireless measurement challenge since the application required some level of mobility. 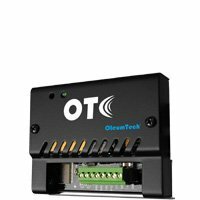 After performing an RF survey of the processing location, OleumTech offered a viable, comprehensive wireless automation solution using its OTC Wireless Sensor and I/O Platform to give the grape grower full wireless coverage of the entire site of operation. Wireless RTD Temperature Transmitters (SM5000-RTM) – 29 wireless transmitters that were compatible with grower’s existing RTD temperature sensors which were integrated and mounted to each pallet of the grapes for temperature monitoring across all three phases of cold storage processing. 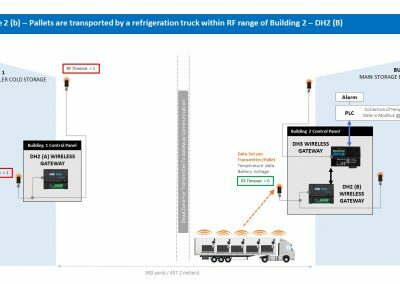 DH2 Wireless Gateways (WG-0900-DH2) – The project required deploying two DH2 Wireless Gateways to collect temperature data from the 29 temperature transmitters regardless of their positioning. The DH2 (A) was installed near Building 1, the pre-cooler cold storage facility, inside a NEMA control panel. 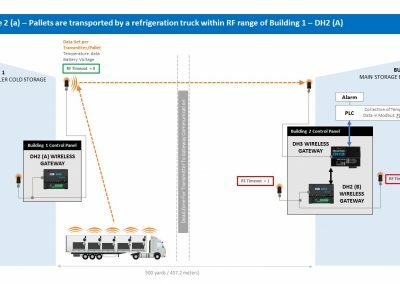 An RF splitter was used, allowing dual antennas to be deployed ensuring coverage inside Building 1 and the parking lot as the pallets traveled inside a truck. 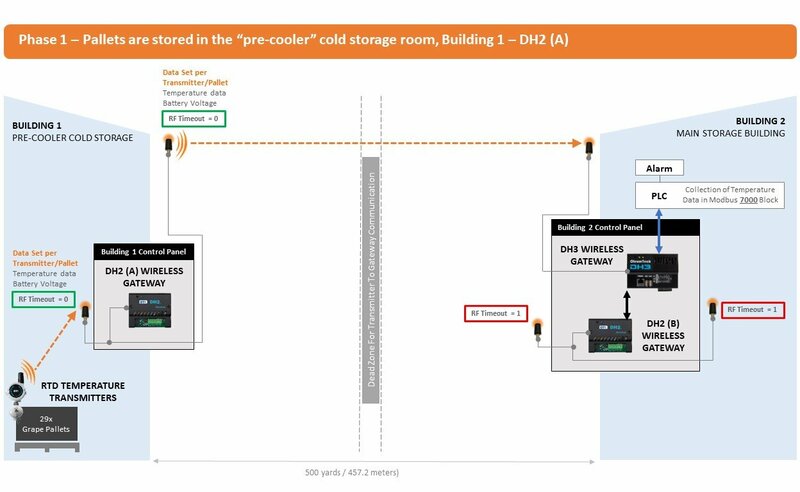 Temperature and transmitter health data including battery life, RSSI, RF timeout were wirelessly transmitted to the DH3 gateway that was connected to the PLC. The DH2 (B) was a clone2 of the DH2 (A) so that it could collect data from the same set of transmitters. It was installed in a similar manner as the DH2 (A), but located near Building 2, the main storage facility. On this cloned gateway, wirelessly sending data to the DH3 portion was removed so that the DH3 would only receive temperature data from DH2 (A) for Building 1. Thus, the DH2 (B) was connected to the DH3 via Serial Modbus connection. DH3 Wireless Gateway (WG-0900-DH3) – A DH3 Wireless Gateway was deployed alongside DH2 (B) near Building 2, with its own antenna outside of the building so that it can wirelessly collect data from DH2 (A). 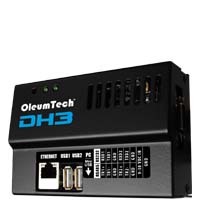 SCADA connectivity – the DH3 was connected to the grape grower’s PLC via an Ethernet connection and used Modbus TCP/IP. The PLC was collecting two sets of data for the same set of 29 RTD transmitters by utilizing RF timeout data to qualify which set of data was true. An RF timeout value of “0” would indicate that data set was true since it meant there was good communication. If the RF time out value was “1”, then that would indicate that the data set was false since that meant there was loss of RF communication. 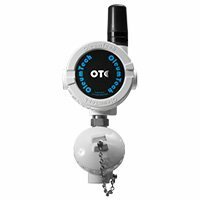 SCADA role – The PLC qualified and logged the temperature data from the OTC Wireless System. If any pallet was nearing the 32 ˚F threshold, it would trigger an alarm so that the grower’s staff can take immediate corrective action. 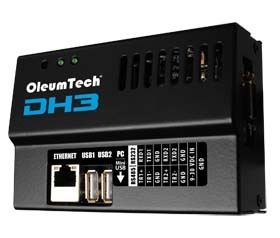 OleumTech supplied 29 RTD Temperature Transmitters (SM5000-RTM) that were connected to the customer-supplied FDA-approved RTD temperature sensors. These were individually mounted to each grape pallet. The temperature, device health, and RF communication data were transmitted to DH2 (A) or DH2 (B) depending where the pallets were located. The data set transmitted to two DH2 Wireless Gateways that ultimately ends up at the DH3. Then, the PLC polls the data from the DH3 via Modbus TCP/IP. 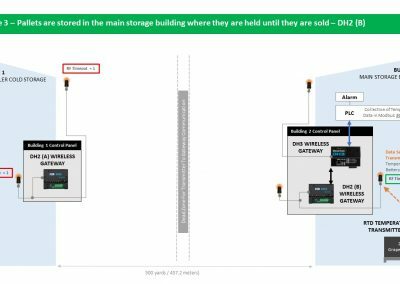 (Modbus 7000 block for DH2 (A) data and 3000 block for DH2 (B) data). 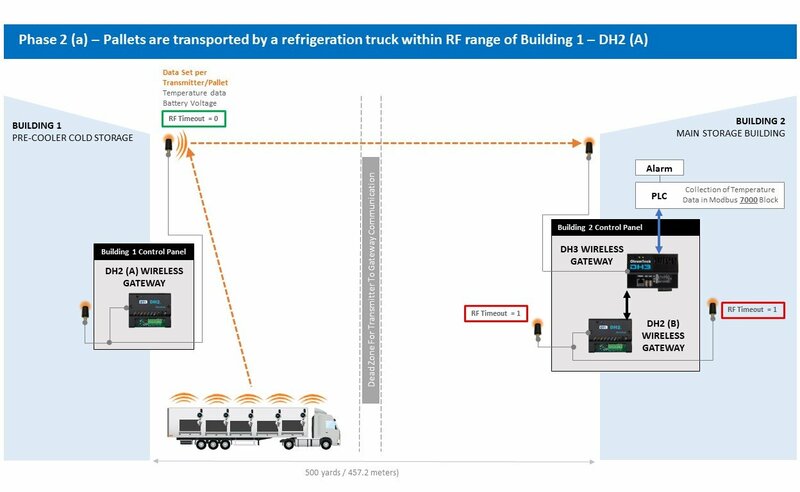 If the pallets are located inside or near Building 1, then DH2 (A) would wirelessly receive the data. 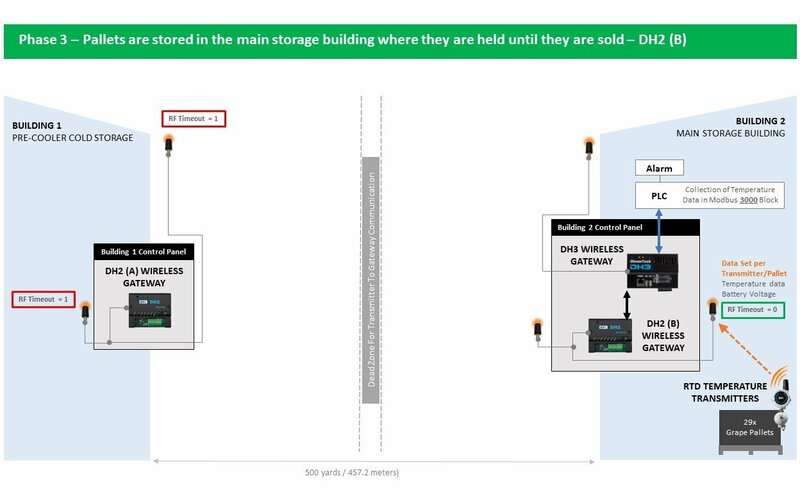 The collected data was stored in DH3’s 7000 Modbus register holding block for PLC to access. 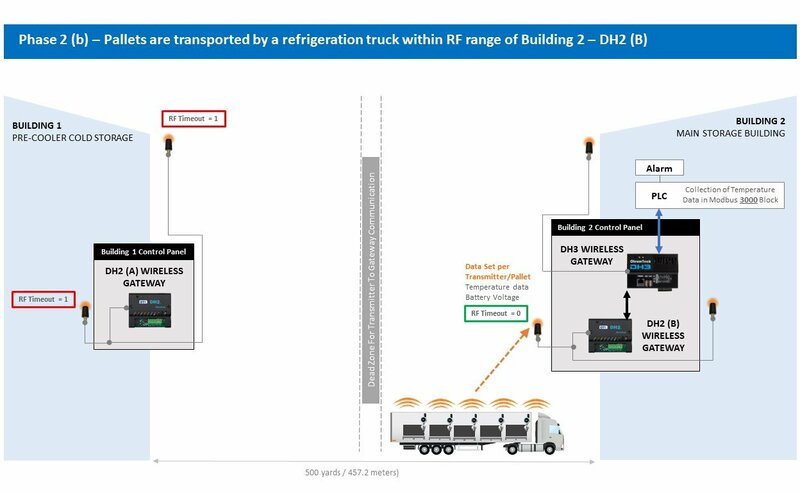 If the pallets are located inside or near Building 2, then DH2 (B) would wirelessly receive the data. The collected data was stored in DH3’s 3000 Modbus register holding block for PLC to access. As a result of deploying the OTC Wireless Sensor & I/O Network platform, the grape grower achieved their objective of seamlessly monitoring temperature data of each pallet of grapes on all phases of their storage and refrigeration operation.